SYNOPSIS (Courtesy of IMDb): A man and a woman move in to neighboring Hong Kong apartments and form a bond when they both suspect their spouses of extra-marital activities. The End of a Marathon: I watched Wong Kar-wai’s Chungking Express on New Year’s Day, and it became Post #1 for this blog. Ninety-eight movies later, I’m bringing this journey to a close by returning to Wong Kar-wai. Strengths: The film is a bit like a Chinese version of Brief Encounter, but with slow motion and lots of Nat King Cole. You don’t need to look at the credits to know that Wong wrote the script because there’s such an organic wholeness to the film. We usually expect a movie’s visuals and sound to serve the story, but this is a film of mood and moments, where atmosphere matters more than narrative. Normally that would spell trouble, but Wong is the rare director who can elevate style over story without a loss of human feeling. I’ve watched exactly two films in the last 100 that exhibit genius with music, and both are Wong Kar-wai’s. The selections themselves are smartly offbeat, but the key is that Wong doesn’t deploy a tune here and a tune there: he repeats a passage until it becomes a motif that carries the drama. It’s become common for movies to bludgeon you with sound, using it as a substitute for genuine emotion, but this is different — Wong’s music is woven directly into the fiber of his story. The same is true of slow motion. It’s an effect that’s easy to abuse and I seldom like it, but here again Wong succeeds by employing great skill and by integrating the effect tightly into the texture of the film. He isn’t slowing things down to signal Drama! but to isolate a mood and capture a subjective experience. Suppressed desire is consuming the characters, so Wong uses slow motion and other effects to consume the movie frame itself. In these altered moments, time stretches, small movements are accentuated (Maggie Cheung’s hips), and the characters’ heady immersion becomes our own. 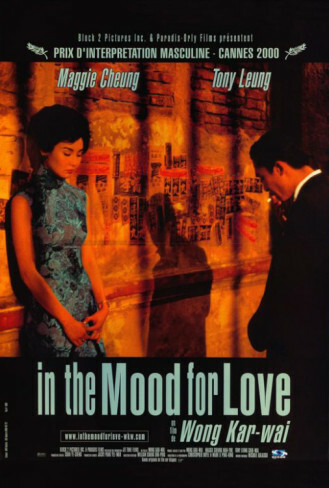 Weaknesses: If In The Mood For Love were a song, it would be one with great depth of feeling but a very simple melody. You can make a good case for melodic simplicity — all the more room to improvise. And I think that’s valid as it applies to the film’s plot, but the movie’s thinness of characterization is a problem. One of Wong’s most effective moves is to withhold any shots of Mr. Chow and Mrs. Chan’s spouses (we only get their voices). But that’s not all he withholds: Beyond their marriages and stifled feelings for one another, we know next to nothing about them. We see where they work. We see (and like) how they dress. But aside from a desultory bit about Mr. Chow writing comics, there’s no indication of their deeper aspirations and needs. That lack of depth winds up limiting the power of the final act. To feel the full impact of their separation, we need a better grasp of their full personalities. Performances: If there are actors who look better together than Tony Leung and Maggie Cheung, I want to see them. Cheung’s dresses deserve their own Oscar, and Tony Leung should feel thankful that no technology exists for me to steal his face. The rapport they establish is intense, and it’s accomplished almost entirely through indirect looks and subdued emotion. Best Moment: Woman walks down an alley to buy noodles. How many directors could turn that into a moment of transcendent sexiness? And the rain and the leaning against walls and the conversation that repeats itself but not exactly. And there’s the conclusion. It’s a moment of haunting beauty, and I could not have asked for a lovelier image to close this trek through world film.